Dale Cramer spent his formative years traveling the world as an Army brat, then settled in Georgia at the age of fifteen when his father retired. After high school he became an electrician, a job that took him to places as diverse as power plants, stadia, airports, high-rise office buildings and a hard-rock mining operation. Twenty-five years of experiences in the trades provided him with the wealth of characters, stories and insights that populate his novels. When he married his childhood friend, Pam, in 1975 he had no way of knowing they would not have children until fifteen years later. In his early forties, when Dale left his job to become a stay-at-home dad, he suddenly found himself with time on his hands, so he pursued a lifelong dream and taught himself to write. Using an online writer’s forum as a training ground, he wrote his first short stories in 1996. As his writing skills improved he turned to novels, publishing his first book, Sutter’s Cross, in 2003. 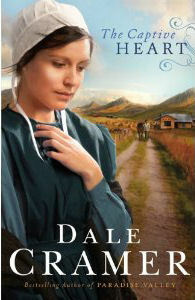 Since then, Dale has published four more novels and garnered a measure of critical acclaim with two Christy Awards, a listing among Publisher’s Weekly’s Best Books of 2004 and numerous other Best lists. Dale and his wife Pam live in Georgia with their two sons. Bandit troubles intensify as Caleb Bender's family tries to settle into their new life in 1920s Paradise Valley. When El Pantera kidnaps Rachel and leaves her brother, Aaron, for dead, Jake Weaver and the Mexican native Domingo pursue the bandit leader to his mountain stronghold in a hopeless rescue attempt. Jake and Domingo manage to escape with Rachel, with the bandits hot on their trail. In a desperate attempt to avoid recapture, Domingo puts himself squarely in harm's way, giving Jake and Rachel time to get away. This is not the quiet life Caleb Bender envisioned when he led his family out of Ohio. What is a father to make of his daughter's obvious affection for a man outside the fold? And how will a pacifist Amishman like Caleb respond to the events that threaten his family and their way of life?